When do the 2016 standards come into effect? Who do you speak to get advice about assessment of a particular patient? Which standards (private or commercial) should be applied? How do I conduct an assessment of a heavy vehicle operator under the requirements for fatigue management? What about practical driver assessments? The standards come into effect on 1 October 2016. The Driver Licensing Authority in your State or Territory is able to provide advice in this regard. See Contacts for Health Professionals for details. The standards were produced through an extensive consultation process overseen by the National Transport Commission and Austroads, and involving a Maintenance Advisory Group representing driver licensing authorities, health professionals and drivers. Royal Australasian College of Physicians – Chapter of Addiction Medicine. 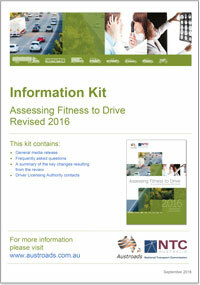 Assessing Fitness to Drive contains two sets of medical standards – private vehicle driver standards and commercial vehicle driver standards. The choice of which standards to apply when examining a patient for fitness to drive is guided by both the type of vehicle and the purpose for which the driver is being authorised to drive. Drivers applying for or holding a license class C (Car), R (Motorcycle) or LR (Light Rigid) UNLESS the driver is also applying for an authority or is already authorised to use the vehicle for carrying public passengers for hire or reward or for the carriage of bulk dangerous goods or in some jurisdictions for a driver instructor's license. NOTE: A person who does not meet the commercial vehicle medical criteria may still be eligible to retain a private vehicle driver licence. In such cases, both sets of standards may need to be consulted. I have been asked to conduct an assessment of a heavy vehicle operator under the requirements for fatigue management. 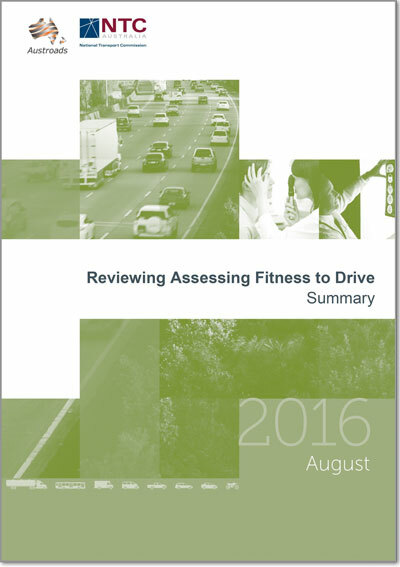 What does this mean and how do I apply the standards contained in Assessing Fitness to Drive? The National Heavy Vehicle Accreditation Scheme was introduced in 2008 to support improved safety in the heavy vehicle industry. Under the scheme, standards are set for various aspects of heavy vehicle operators, including fatigue management. Basic Fatigue Management and Advanced Fatigue Management modules of the scheme set out standards relating to drivers' health. These standards require that drivers are in a fit state to safely perform their duties. Specifically the standards require that drivers undergo regular health assessments to make sure they meet the medical criteria for commercial vehicle drivers contained in Assessing Fitness to Drive, with a particular focus on aspects such as sleep disorders, substance abuse etc. Assessments must be carried out every three years for drivers below the age of 50 and yearly for those 50 and over. In addition to health assessments, the standard also sets out a range of measures to support drivers' health. 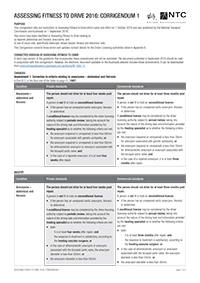 Forms to facilitate these assessments are included on this site. A health professional may request a practical driver assessment to provide information to supplement the clinical assessment in some borderline cases and to assist in making recommendations regarding a person’s fitness to drive. However, practical assessments have limitations in that a patient’s condition may fluctuate (good days and bad days) and it is not possible to create emergency situations on the road to assess quickness of response. Thus, practical assessments are intended to inform but not override the clinical opinion of the examining health professional. In addition, there are clinical situations that are clearly unsuitable for on-road assessments, such as visual impairment or significant cognitive impairment. There is a wide range of practical assessments available, including off-road, on-road and driving simulator assessments, each with strengths and limitations. Assessments may be conducted by occupational therapists trained in driver assessment or by others approved by the particular driver licensing authority. Processes for initiating and conducting driver assessments vary between the states and territories and choice of assessment depends on resource availability, logistics, cost and individual requirements. The assessments may be initiated by the examining health professional, other referrers (e.g. police, self, family) or by the driver licensing authority. Recommendations following assessment may relate to licence status, the need for vehicle modifications, rehabilitation or retraining, licence conditions and reassessment. It is not the intent of Assessing Fitness to Drive to specify the assessment to be used in a particular situation. Health professionals should contact their local driver licensing authority for details of options or refer to Appendix 10 of Assessing Fitness to Drive: Specialist driver assessors.